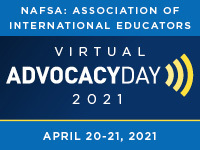 At NAFSA's Advocacy Day, speak out for students, scholars, and policies that matter to you! After a day of training and strategizing, you will head to Capitol Hill with all the tools you need to educate Congress on how international education impacts your state and district and why we need a more globally engaged and welcoming United States. Personal meetings will be scheduled for you with your elected officials and their staff in both the Senate and House of Representatives. Please note that space is limited and cancellations with refunds are available through Wednesday, January 23, 2019. Members of Congress Tweet on Value of International Students and Scholars. The Advocate of the Year Award recognizes a NAFSA member who exhibits excellence in international education advocacy, inspiring others to make a difference by engaging with elected officials and promoting policies that support creating a more welcoming and globally engaged United States. Meet NAFSA's 2019 Advocate of the Year: Nora Cavazos of The University of Texas Medical Branch. FAQs about NAFSA’s Advocacy Day. Access the briefing materials to prepare for Advocacy Day 2019. View the 2019 Advocacy Day schedule. Use our template letter to request approval from your supervisor to attend Advocacy Day. Learn more about the NAFSA Meeting Safety and Responsibility Policy.